INTUITION. Your Sixth Sense. 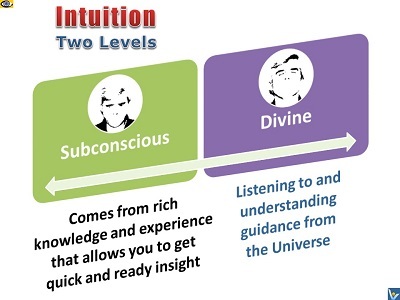 Divine Intuition, Inner Voice, Listen to your intuition. It will tell you everything you need to know. There is no logical way to the discovery of these elemental laws. There is only the way of intuition. All great men are gifted with intuition. They know without reasoning or analysis what they need to know. You need not ask, What is truth? Instinct won't hear, it is deaf. Intellect will hear but it can only philosophize; it is blind, it can't see. Intuition is a seer, it has eyes. It sees the truth – there is no question of thinking about it. Instinct and intuition are both independent of you. Instinct is in the power of nature, of unconscious nature, and intuition is in the hands of the superconscious universe, the consciousness that surrounds the whole universe, the oceanic consciousness of which we are just small islands – or better, icebergs, because we can melt into it and become one with it. Sincerely surrendering to your heart intuition gives you access to new intelligence and opens the door for new possibilities. Add heart intelligence to your attitudes and conceptual understandings so the head can operate with less limitation. The best and fastest decisions are made from intuition which is drawing from your knowledge, experience, and your ability to receive and interpret signals from the Universe. Intuitive thinking is a feeling that doesn’t use rational processes such as facts and data. Your rich experience is the key to building your intuitive decision making ability. The more patterns and happenings you get exposed to, the more your subconscious intuition can draw from experience and statistics. → Steve Jobs is one of the most successful → entrepreneurs of our generation. His success story is legendary. Put up for adoption at an early age, dropped out of college after 6 months, slept on friends’ floors, returned coke bottles for 5 cent deposits to buy food, then went on to start Apple Computers and Pixar Animation Studios. Ram Charan and Noel Trichy in their book Every Business Is a Growth Business write: "Many companies have seemingly done well thinking from the inside out. 3M achieved legendary success as an innovator by giving its people room to develop their ideas in quasi-entrepreneurial fashion. For years, it ranked among the leaders of FORTUNE's list of most admired companies. But during the first half of of the 90s, 3M grew its top line less than 4% despite the brilliance of its entrepreneurial technologists. There wasn't enough → feedback from the marketplace – missing were the insight into the customer's mind, and the intuitive observations about needs that could have translated inventiveness into powerful growth." In late 90s, new leadership got the company back on track with outside-in growth initiatives. I I never get the accountants in before I start up a business. It's done on gut feeling.